This "Historically Speaking" column appeared in the Exeter News-Letter on Friday, May 11, 2012. In 1944, William Seward retired from a long career as a pharmacist in Exeter. 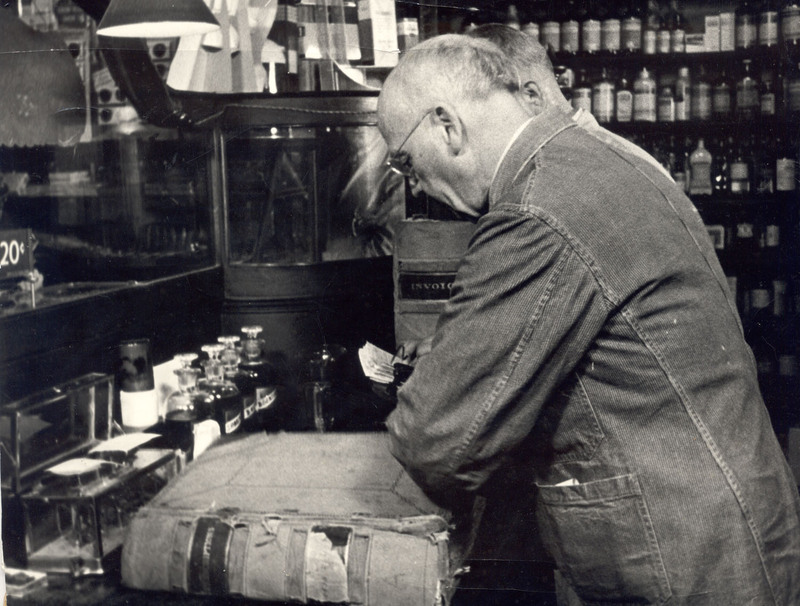 For fifty-six years he’d run his drugstore on Water Street in the Merrill Block and it had become, not just a place to pick up prescriptions, but a gathering place for generations of Exeter’s youth. By mid-century, however, there were some drugs that were proven to actually treat and occasionally cure health problems. In 1848, Charles Merrill, the son of hat-maker Abner Merrill, had purchased a general store with his brother. The busiest part of the shop proved to be the drug counter and the brothers decided to specialize in the new business of selling only medicines. Charles studied the latest in pharmacology and joined the American Pharmaceutical Association in 1858. After his brother retired, Charles became the sole owner. The business proved profitable and soon Merrill was able to erect one of the most impressive and massive storefront blocks on Water Street – the Merrill Block. Among the many types of drugs and medicines sold at Merrill’s drugstore was a class of drink thought to improve health and increase energy. Although some carried high levels of caffeine or, even worse, cocaine, the flavors were bitter and improved with both sweetening and carbonation. Merrill, like most druggists at the time, installed a soda fountain in his shop to encourage people to imbibe in these seemingly healthy drinks. In 1886, Merrill retired and sold the shop to Edward Cram. By that time, the medicinal qualities of soft drinks had fallen out of favor – probably because they were addictive. Druggists now assured the public that their soda fountains sold only wholesome drinks. Cram hired a young William Seward to manage the store. Within seven years, Seward had put himself through the Massachusetts College of Pharmacy and bought out his employer. Partnering up with Albert Weeks, the store became Weeks & Seward’s Drugstore, combining a full service pharmacy with a soda fountain. Phillips Exeter Academy students frequented the place, as did many local kids, to hang out and perhaps meet girls. The store’s publicity in 1910 boasted, “they carry an extensive stock of drugs, chemicals, proprietary medicines and remedies, choice imported and domestic cigars and tobacco, toilet accessories of all kinds, leather goods and stationery. At their soda fountain is served delicious soda, with pure fruit juices, and delectable ice cream.” The ice cream must have been a challenge, as the store wasn’t wired for electricity until 1919. Albert Weeks retired in the 1920s, but William Seward continued the business and prospered well enough to purchase the entire Merrill Block in 1927. Prohibition increased his soda fountain sales but the store continued to function as a drugstore. In 1941, the March of Times news reel production company came to Exeter to film New England’s Eight Million Yankees. The film was a propaganda piece intended to foster patriotism when World War II was on the horizon. Highlighting the small town appeal of New England, Exeter was chosen for its quaint main street appeal. The film, which can be viewed in short bits on YouTube, features many of Exeter’s local civic and business leaders. Chief among them is 68 year old William Seward shown filling prescriptions from an ancient log book. “More than any physician in town,” boasts the narrator, “he knows all the ailments of Exeter’s families.” Seward is then shown, somewhat woodenly, handing a pint sized bottle of medicine to a 10 year old boy with the instructions, “Son, you tell your father not to take this all at once, like before. The directions are on the bottle.” The scripted bit brings all manner of uncomfortable questions to mind – like what happened to the patient when he drank the whole bottle the first time and, more importantly to modern viewers, who would give a big bottle of medicine to a kid? Seward retired in 1944, selling the store to his employee, Horace Grant. At the time of his death in 1950, Seward remained a respected member of Exeter society. He was a member of no less than nine fraternal organizations and had served terms as director of both the Exeter Banking Company and the Exeter Cooperative Bank. With three daughters, he was well equipped when he served on the board of trustees for the Robinson Female Seminary. But his greatest service to the town was his drugstore and the soda fountain that brought countless people together.